Denial of Service attacks (DoS) are very common these days. Especially Distributed DoS attacks (called also DDoS) can be executed quite easily by attackers who own large networks of BotNets. Thousands of malware-infected computers (which comprise the so called “BotNets”) are controlled by attackers and can be instructed to start attacks at any target. Usually WebSites are targeted more frequently. Bringing down a website can have a negative effect to the image (in addition to any financial loss) of the company owing the site. A DDoS attack can be purely “volumetric”, which means that the attacker just sends high volume of packets as quickly as possible to flood the bandwidth of the “pipe” connecting the website to the Internet. Also, DDoS attacks can be “Application Resource Exhaustion” which means that the attacking computers create thousands of application requests (e.g HTTP Requests) to a server, thus consuming the application resources. 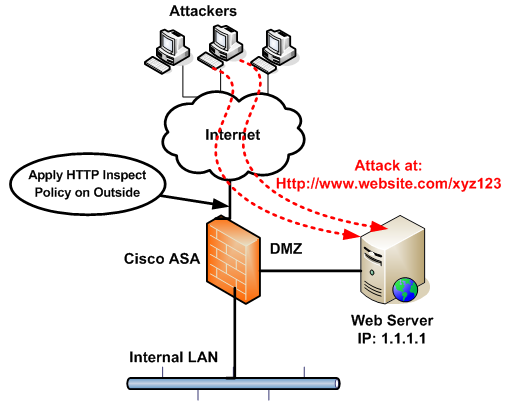 A Cisco ASA Firewall can not help much in a “volumetric” DDoS attack. In such an attack, a dedicated DDoS device is needed or your ISP must do some kind of rate limiting to mitigate the attack. However, for “Application Exhaustion” attacks a Cisco ASA can help to some extend with HTTP inspection using the Modular Policy Framework mechanism of ASA. This is what we are going to describe in this article. Usually, HTTP Application DDoS attacks have a pattern or string which helps you distinguish the attacking HTTP requests from other legitimate requests. For example, HTTP attacking packets might have a common parameter or string, which can be for example the same “User-Agent” used by the attacking script, a common POST or GET URI request, some other HTTP header parameters etc. With the ASA HTTP inspection feature you can match on this common pattern in the HTTP packet thus filter-out the attacking packets and drop them. Recently I was engaged to help mitigate a DDoS attack on a webserver. I observed from the Apache logs that the attacking HTTP requests were all targeting the website on the same URL string, such as http://www.website.com/xyz123. The string “xyz123” was the common pattern for all malicious HTTP requests. Thus with a policy on ASA you can match on the unique string above and drop the packets that have this string in the HTTP URI. !Now attach the policy-map to the ASA outside interface to inspect Inbound traffic. If you enable logging on the drop-connection command (use “drop-connection log“), then you will start seeing logs that the ASA is dropping packets with the matched attacking HTTP string. I really appreciate such a nice article. + What do you think a attacker can change the string? If the attacker change the string then its mean ASA would not help us on this regards. + What do you think if the attacker packets size more than 500 MB – 1 GB then ASA can handle this? Harris please answer these because i haven’t much experience on DDOS mitigation. If the attacker changes the string, then you can find other HTTP parameters to match on. For example, some times the “user-agent” used in the HTTP header from the attacking scripts is usually the same and looks different from the normal user-agents used from legitimate browsers (such as IE, Mozilla etc). Remember that DDoS attacks coming from BotNets use the same malware script running on infected computers. A Command-and-Control server gives instructions to the infected computers to start an attack. Since they all have the same attacking script, they all use the same HTTP communication and behavior. If the attack is volumetric (as you say 500MB – 1GB) then ASA can not help. What device can actually mitigate the volumetric ddos attack? In my workplace we are using Arbor Networks devices which are dedicated for DDoS attacks (both volumetric and application level attacks can be mitigated). They are kind of expensive but they are really good. you said that we can not stop volumetric attack on ASA. but in case of DNS flood attack we mitigate the volumetric attack using ASA by using modular policy framwork. by setting up embryonic connection . what do you say about this. and if you have any suggession then let me kknow if i am wrong. When I say volumetric attack I mean an attack with high traffic that fills up the whole “pipe”. This attack can not be mitigated by the ASA. If the DNS flood attack does not fill up the whole network connection then it can be mitigated. how i can do this using asdm ? will deny access using GET and POST ? apologise, and if a have multiples attackstrings, how i can add all strings on the system to deny access ? The configuration described in this article matches only GET requests with strings appearing in the URL. For matching POST request with strings appearing in the Body of the HTTP then you must change the “match” command to “match request method post”. Also for attacks that use multiple strings you will need to do some regular expression matching (not easy). It all depends to the actual situation.